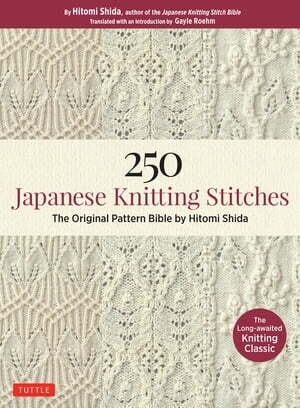 Collins Booksellers - 250 Japanese Knitting Stitches by Hitomi Shida, 9781462919871. Buy this book online. Hitomi Shida's previous work, the Japanese Knitting Stitch Bible was released by Tuttle in October 2017 and has already been purchased (and tested) by thousands of avid knitters who are thrilled to discover a treasure trove of elegant and intricate new patterns. 250 Japanese Knitting Stitches was Hitomi Shida's first effort and, like its successor, is filled with her highly original and beautiful designs and variations on knitting classics. Shida's finished projects are a wonder to behold and accomplished knitters will brave even the most daunting of stitch patterns to create them. Filled with 250 distinctive and inventive patterns—with a stitch diagram and photo for each pattern—this highly anticipated book is destined to be on every knitter's bookshelf.